Everywhere you look, technological improvements are making life easier. At Printers Row Dental Studio, we use the latest dental technology to ensure you receive the highest-quality dental care. We’re committed to offering our patients the latest high-quality technology to provide unparalleled care. Dental X-rays are an important part of oral preventative maintenance. Digital X-rays are one of the ways your dentist at Printers Row Dental Studio can get an accurate picture of your oral health. Today, digital X-rays are rapidly replacing traditional X-ray film methods, and they produce computer images of teeth, gum, and other oral structures. These images allow your dentist to spot the earliest signs of dental issues, which is essential in treating them effectively and preventing potential discomfort and costly procedures. Digital X-rays require less radiation than traditional film X-rays. They also eliminate chemical processing and disposal of hazardous waste, making them a superior, “greener” alternative. Tooth color can vary from tooth to tooth. The VITA Easyshade® is a digital spectrophotometer that passes light through a tooth to assess its color. 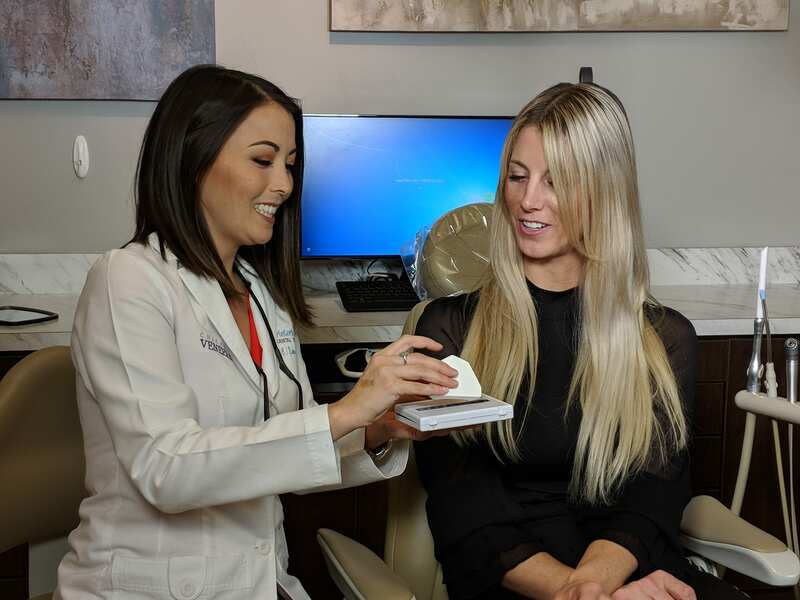 This tool allows your dentist at Printers Row Dental Studio to determine the correct shading of your natural teeth and ceramic restorations to ensure an accurate color match. A picture is worth a thousand words, and that’s true at Printers Row Dental Studio. Since digital photography is common and easy to use, we use this technology to document the condition of your teeth to send to the lab and to track your progress. Digital photography is a valuable tool for record-keeping and lab communication. Best of all, with digital photography, the images we capture can showcase the changes we make to improve your smile and oral health! The 3M™ True Definition Intraoral Scanner allows your dentist at Printers Row Dental Studio to create a fast and accurate digital dental impression. The scanner uses a hand-held wand to create an accurate 3D replica of your oral anatomy, giving your dentist a true picture of your mouth. The 3M™ True Definition Scanner is a great solution for patients who have had previous problems with conventional dental impressions, due to strong gag-reflex. At Printers Row Dental Studio, we use a diode laser for soft tissue so that we can perform fernectomies & gingivectomies. This laser is painless and causes very little bleeding. Additionally, it requires a very short recovery time. For general restorative procedures and fernectomies & gingivectomies, the diode laser is an excellent and painless option. Your dental exam is just as important as your other healthcare checkups. At Printers Row Dental Studio, your oral health is our top priority! We are here to answer any questions that you may have about your overall oral health and ways to ensure that you maintain a strong, healthy smile. Our dentists and dental hygienists are highly trained and experienced dental professionals who are devoted to keeping your mouth healthy, so that you can live your best life. To learn about how dental technology can improve your smile, call us today at (312) 435-0411 to schedule your appointment!